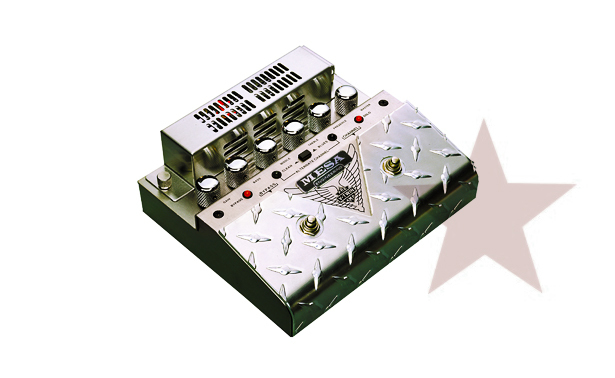 The Mesa Boogie V twin is a serious valve guitar pedal/pre-amp based upon their famed Dual Rectifier Head amplifier. Housed in no-nonsense chequer plate the V-twin uses two 12AX7 dual triode vacuum tubes / valves. With three modes – clean, blues and solo the V twin has four stages of all-tube preamp circuitry with outputs for host amps, power amps and recording consoles. Simple to use yet truly versatile the Mesa Boogie V-Twin will produce big clean tones and deep blues sounds as well as high-octane rock or metal sounds. The V twin can be run direct to tape or plugged into a power amp or PA and has a headphone output for practice.